It was a beautiful spring day and while Ellen was at school, Wire Dog was taking a nap in the backyard. He heard the loud flutter of wings and opened one eye to check out what was flying over his doghouse. 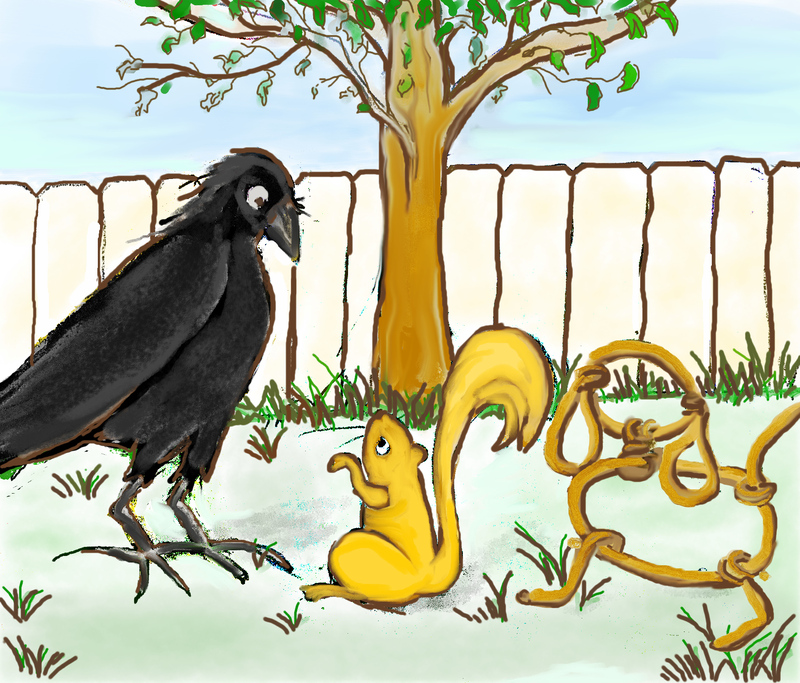 It was a large black bird and it was now sitting on a branch in the oak tree high above Scout the squirrel’s nest. Scout was out of his nest in a flash and shading his eyes from the sun with a paw. He immediately took offense to the newcomer in his tree. Perched on a branch, he began to chatter angrily. The bird took no notice as its attention was centered on making a nest from twigs, bark, grass, and mud. Wire got up to get a better look. “I see you have a new neighbor, Scout,” he called up to his friend. The bird could not help but hear the conversation and decided to fly down to the yard and introduce itself. As it landed, Wire automatically backed up a few inches to avoid a collision. It was a very large bird. “Name’s Edgar,” the bird said, holding out a wing. Wire thought the bird was even larger in person and felt a bit nervous, looking at the sharp beak, but held up a paw and gave the wing a friendly tap. Edgar raised a wing above his eyes and squinted against the morning sun to get a better view of the indignant squirrel. “He thinks you are stealing his space,” Wire explained diplomatically. Edgar strutted around the tree and returned. Scout had sat fuming, while watching from the branch, and now decided to come down to confront Edgar. His sharp claws made a scraping sound against the tree trunk, as he scampered to the ground. Wire saw him coming and was a bit wary of the encounter, so he backed away a few more inches. Even standing on his hind legs, Scout was still a good ten inches shorter than Edgar. Hands on hips, he confronted his adversary. Seeing the meeting was growing into an angry confrontation, Wire stepped between them. Edgar was growing bored with the conversation so he wandered over to Wire’s food bowl. It was filled with chunks of delectable kibble and he could smell the aroma of beef and cheese. Dipping his beak down, he began to dine. Watching, Scout tilted his head to one side, his whiskers twitching as he flicked his bushy tail. Wire quickly turned to stare in disbelief as Edgar gobbled up the kibble. Now the problem was personal and he didn’t like it at all. It was one thing to share, but another to lose all one’s kibble. Wire blinked his eyes in surprise at the comment. This was a very disagreeable situation indeed. Edgar had no respect for others’ belongings. Wire watched as Edgar’s beak formed a smirk. After that he flew to the window sill of an open window of Ellen’s house. “Look, Wire! He’s going inside!” Scout exclaimed, amazed at Edgar’s outlandish behavior. A few minutes passed before Edgar flew out and back to his nest. Wire and Scout exchanged a look of surprise. “What do you suppose he was doing in the house? That is Ellen’s room,” Wire said, his eyes wide in shock. Wire nodded, looking down at his empty food bowl. When Ellen got home from school, she went to her bedroom and put her backpack on her bed. A nice breeze was coming in her open window. Hurrying downstairs, she went outside to see Wire. She found him sitting by his doghouse. Wire’s stomach growled. He now knew that taking a nap that morning and waiting to leisurely enjoy his breakfast had been a bad idea, especially with Edgar’s lack of respect. Trotting into the house after her and then upstairs to her bedroom, Wire wondered if Edgar had flown into the house to find more kibble. Ellen took her school books from her backpack and then spread them out onto her bed. For the next hour, she tackled each subject as she did homework. Wire noticed that she especially had trouble with the math problems. When she was finished, and the books were replaced in her backpack, she decided to get her clothes out for the next school day. She went to her closet and took a navy skirt and a yellow short-sleeve blouse off hangers and then placed the clothes neatly across the back of a chair. Wire continued to watch as she walked across the room to her jewelry box. It sat atop the dresser and today Ellen had left the lid open. A bit disappointed, he knew that now he would not get to see the tiny ballerina dance to the lilting tune. Frowning, Ellen was searching through the box for her gold locket. Unable to locate it, she took all the items from the box, but she still could not find her locket. Puzzled, she put all the pieces of jewelry back inside and closed the lid. Wire waited hoping she would open the box again, so he could see the ballerina dance, but instead she just stood there looking up at the ceiling, thinking. Wire wagged his tail. He could tell Ellen was upset and when he wagged his tail, she always seemed to smile. It wasn’t working today, so he gave up and followed her down to the kitchen. Ellen’s mother was peeling potatoes at the kitchen counter. Wire could smell the aroma of a rich stew broth coming from a large pot on the stove. “Mother, have you seen my locket?” Ellen asked. There was a worried look in her eyes. “We’ll look again after supper,” Ellen’s mother said, wiping her hands on a towel. Wire’s stomach growled loudly, as Ellen shooed him out the back door. He went back to his doghouse and sat down by his empty food bowl to wait for Ellen to bring his supper. Looking at the bowl, reminded him of Edgar and then he remembered the raven flying inside the house. Was it possible that he took the locket? It wasn’t food, so why would he want it? The next morning Wire made sure to eat all his breakfast before Edgar had a chance to steal it. Settling down to take his morning nap, he heard the flapping of wings overhead and saw the raven fly across the backyard. It was another warm day and Ellen’s mother had left the kitchen window open. Wire lifted his head and watched Edgar fly into the house. Only a few minutes passed before he flew outside and back to his nest. Wire was a good friend. Scampering down the tree trunk, he soon joined him. He yawned widely. “Why are you awake, Wire?” he asked. He had hardly spoken when Edgar took flight and sailed over the yard toward the neighbor’s house. Wire and Scout watched in shock as the raven flew through an open upstairs window. Wire reacted first and nudged the squirrel with his nose toward the oak tree. Rolling his eyes, Scout scampered back up the tree. None of this concerned him, but he would check Edgar’s nest for Ellen. She was a pretty girl and always made a sweet little clucking noise when she saw him in the tree. Edgar’s nest was nearly on the uppermost tree limb and it was the biggest nest that Scout had ever seen. At least three times as large as his own, it would easily hold four squirrels. Peeking cautiously over the rim, he saw a silver teaspoon and a gold locket nestled inside. Reaching out a paw, he snatched the locket out of the nest and then hurried down the tree. At the foot of the trunk, Wire was waiting. “This confirms it. Edgar is a thief,” Scout said, holding up the locket. It gleamed in the sunlight. “I could probably climb the drain pipe and reach her window,” Scout offered, shading his eyes from the sun, while judging the distance. “And put it back into her jewelry box,” Wire said, also turning to look at the open window. Scout wasn’t sure he understood. He had no idea what a ballerina was, but he did know what a box was. Hopping across the yard, he quickly reached the drain pipe. His claws made a scrapping noise as they made contact with the aluminum pipe. In a few minutes, he reached the window sill. He sat there, tail twitching, eyes narrowed as he looked inside the room, half expecting to see Ellen’s mother. But there was no one there, so he jumped inside. He had never been in a house before. It was nice and quiet. There was sunshine splashing across the bed. The patchwork quilt looked very fluffy and soft. He couldn’t resist hopping on it and sighed happily. His nest could not compare with the luxury of the bed. Yawning, he curled up into a ball with the locket next to him. Wire stood beneath the window and waited impatiently. What was Scout doing up there? Could he not find the jewelry box on the dresser? Edgar swooped down beside him. There was a silver coin in his beak. He dropped it on the ground. “Wire Dog. My name is Wire Dog. Scout is returning the locket that you stole,” he said, his tone a bit irritable. “Would you want someone to take your nest?” Wire asked, trying to think of a comparison. “Good ideas, Wire Dog.” Edgar’s head rose, his dark eyes met Wire’s. Edgar immediately scooped up the coin in his beak and then flew back to the neighbor’s house and went inside the open window. When he flew back outside, his beak was empty. A quick visit to his nest followed, before he flew from there with the silver spoon in his beak and into the kitchen window. As Ellen arrived home from school and came through the fence gate, he was returning to the backyard. Following her into the house, Wire half-heartedly wagged his tail. He was a little worried about Scout. Why was he taking so long to return to the yard? Would Ellen find him in her room? When they reached the upstairs hallway, Wire started barking loudly. While in the bedroom, Scout woke up with a start and looked around, momentarily confused with his surroundings. He heard Wire barking and Ellen’s voice on the other side of the door. Panicking, he leaped off the bed and the locket bounced to the floor, landing near the hem of the quilt. A second later, he dove out the window, grabbed the drain pipe between his front paws, and then slid down it to the ground. Ellen opened her bedroom door and in the sunlight she saw the glimmer of gold on the floor. She picked up her locket. Wire nodded, his eyes darting around the room, but he saw no sign of Scout. He walked over to the window and looked out. His friend was sitting atop the doghouse. Wagging his tail vigorously now, Wire came to examine the locket resting in the palm of Ellen’s hand. Wire was happy seeing her so happy. He was also happy that Edgar now understood that you should treat others’ belongings with respect and not take things that were not yours, even if there wasn’t a name written on them.